The drone quickly completed a test run in Iceland. A flying drone created a 3D map of an Icelandic cave that had been carved out by flowing lava in a matter of minutes, using LIDAR technology. While cool enough on its own, scientists at the SETI Institute and NASA believe that the same base technology could be used to map the many caves dotting the surface of the Moon and Mars, according to research that will be presented this week at the 50th annual Lunar and Planetary Science Conference — and even search them for life. Andrew Horchler, the Director of Future Missions and Technology at Astrobotic, the robotics company that partnered with the SETI institute for this project, envisions a future in which drones are able to dive into volcanic caves and create similar 3D maps while searching for signs of water or geologic activity that would better inform future crewed missions into space. 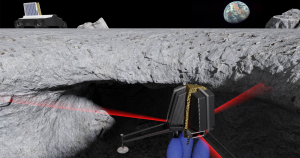 “Small free-flying spacecraft might be the ideal robotic platform for the exploration of lava tubes on Earth, the Moon, and Mars for the simple reason that they would not need to come in direct contact with any of the rough and potentially unstable surfaces found inside caves and lava tubes,” he said in a press release. The thin atmosphere on Mars and the Moon’s lack of an atmosphere make it hard for a conventional quadrotor drone to stay aloft. While NASA developed a helicopter-like drone capable of flying on Mars last year, the team behind this new research suggest that equipping a drone with small thrusters may be the way to go.